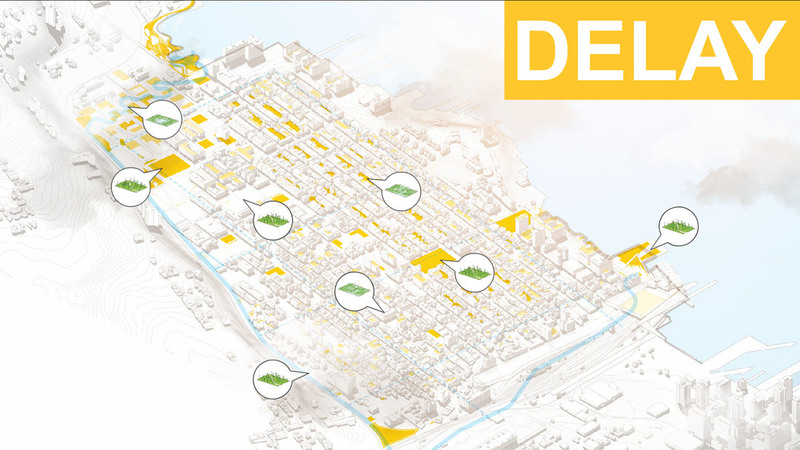 Organized by Hurricane Sandy Rebuilding Task Force, Rebuild by Design was a multistage regional design competition aimed at developing innovative projects to protect and enhance Sandy-affected communities. 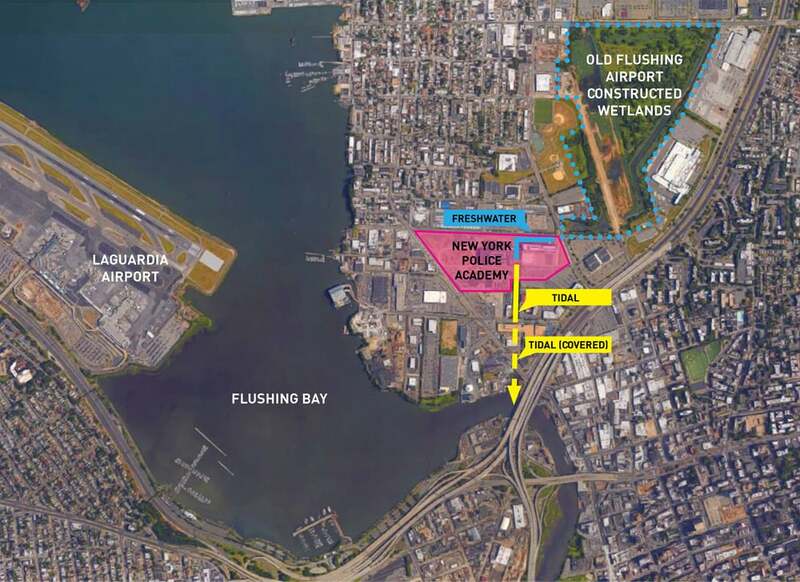 The OMA, Balmori Associates, Royal Haskoning, HR & A proposal Resist, Delay, Store, Discharge for Jersey City, Hoboken and Weehawken was awarded $230 million. Jersey City, Hoboken and Weehawken are susceptible to both flash flood and storm surge. As integrated urban environments, discreet one-house-at-a-time solutions do not make sense. What is required is a comprehensive approach that acknowledges the density and complexity of the context, galvanizes a diverse community of beneficiaries, and defends the entire city. 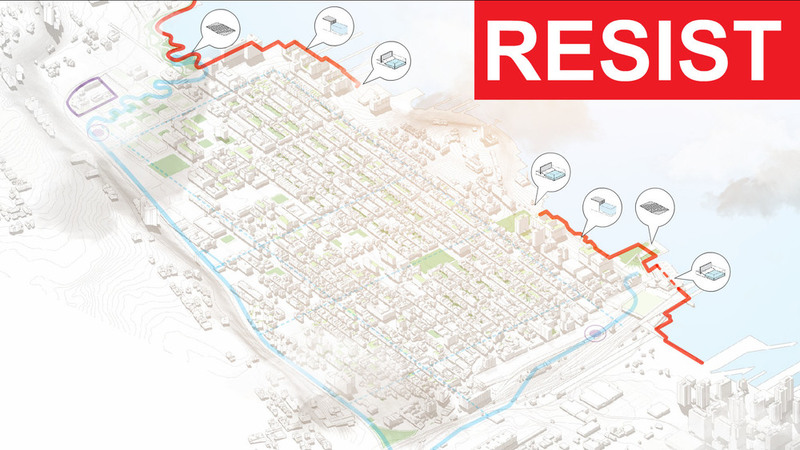 Our comprehensive urban water strategy deploys programmed hard infrastructure and soft landscape for coastal defense (resist); policy recommendations, guidelines, and urban infrastructure to slow rainwater runoff (delay); a circuit of interconnected green infrastructure to store and direct excess rainwater (store); and water pumps and alternative routes to support drainage (discharge). Our approach is framed by a desire to understand and quantify flood risk. In doing so, we are better positioned to identify those opportunities that present the greatest impact, the best value, and the highest potential — our areas of focus. Our objectives are to manage water for both disaster and for long-term growth; enable reasonable flood insurance premiums through the potential redrawing of the FEMA flood zone; and deliver co-benefits that enhance our cities. These are replicable innovations that can help guide our communities on a sustainable path to living with water. For the landscape team the project galvanized the ideas of the importance of the size of the unit to be protected, in this case the whole town of Hoboken, a small town, and let to the conclusion that units of a similar size were ideal sizes in which work, leading to rather less costly solutions. Three landscape systems define the organization of the NYPA: the muster courtyard, the drainage ditch and the perimeter landscape. Each system is defined by specific programmatic attributes, but has been designed to tie the campus together as a whole. The muster courtyard at the heart of the campus is defined by two elements in a field of decomposed granite: the muster and the garden. Framed by stately trees and light poles, the muster is also a flexible event space. At the main entrance to the campus is a regimented entry grove of 36 Tulip trees symbolizing a company (36 recruits). Formed by a series of linear sunken planters the grove allows for east west circulation. The badly named drainage ditch is an unusual feature for this type of project but praiseworthy in its achievements. As a linear canal it bisects the Academy, serving as both an interface between the campus program and an innovative natural drainage infrastructure. The canal, a unique condition of both freshwater and tidal ecologies, is a richly planted landscape of native and wetland species working to scrub the water clean through displacement, aeration and filtration. The planted edges and terraces accommodate the fluctuating water levels- designed within the parameters of LEED and 100-year flood models. But its great contribution is its use as visual and physical contrast to the necessarily strict layouts of the rest of the spaces. 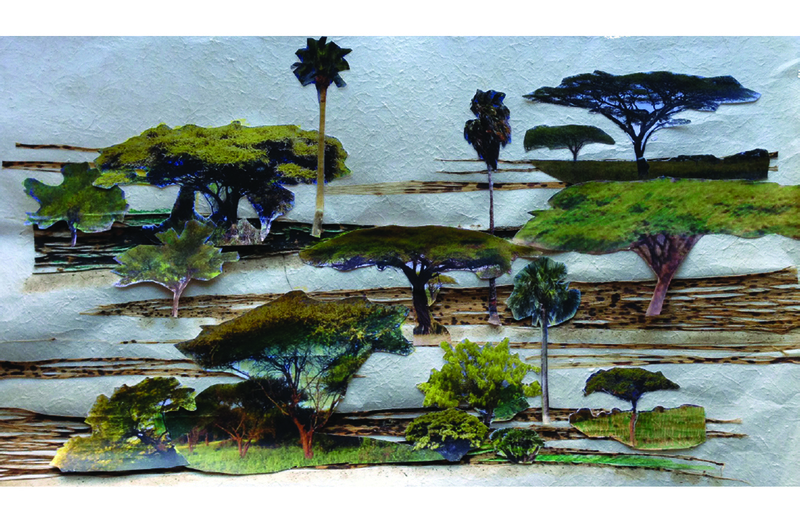 The perimeter landscape responds to the nature of the project phasing. 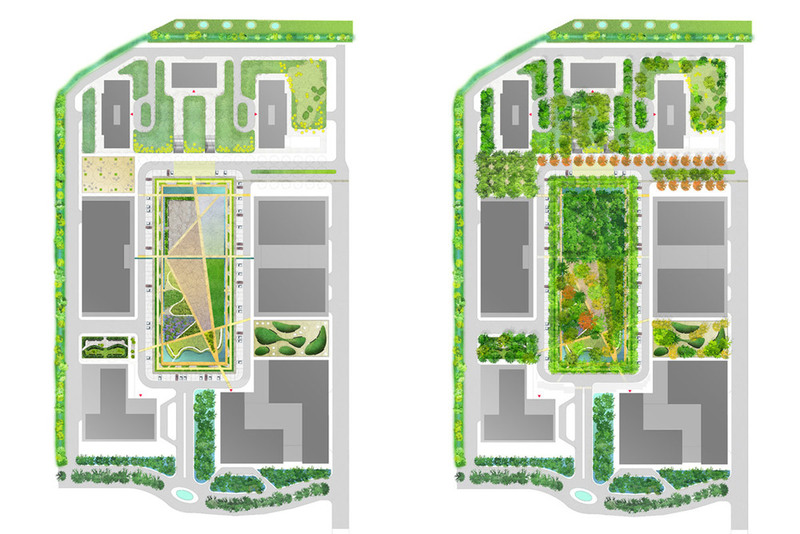 Since much of the perimeter and parking areas will be developed in later phases of the project, the planting strategy is to surround the academy with a native meadow and trees planted outside of future building footprints. Ciudad Empresarial Sarmiento Angulo is an urban project in the heart of Bogota, Colombia that marks the midpoint between Bogota’s historic downtown and the international airport. As Bogota has rapidly developed along Calle 26, the city’s most important axis, Ciudad Empresarial Sarmiento Angulo will emerge as Bogota’s prominent cultural and commercial center. The master plan for Ciudad Empresarial Sarmiento Angulo spans three blocks creating an integrated system of public space that will serve as a critical junction between three distinct areas of the city: Parque Simon Bolivar to the north, Centro Administrativo Nacional to the east, and a residential neighborhood to the west. A public pedestrian spine connects all three blocks with a series of bridges over vehicular cross streets. The center piece of this mixed use development is a public square that contains a new performing arts center and hotel. 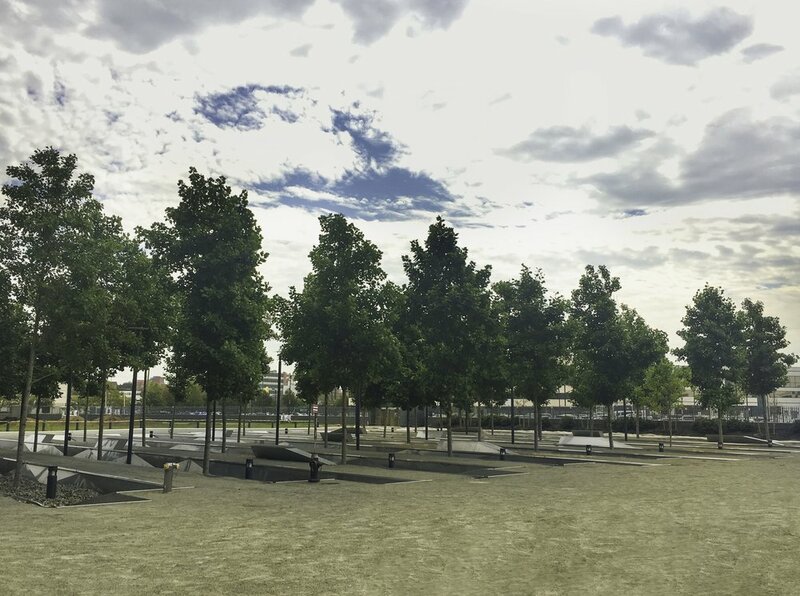 The square fuses the existing open space together, creating a new public center for the city. The landscape expresses the diverse ecology found in Colombia with each block containing a distinct botanical environment and color palette comprised of indigenous Colombian plants. The blocks are connected through water elements that fluctuate in level depending on water availability, accommodating a variety of social and ecological programs. Vibrant colors are found in both the paving and vegetation, creating a link to the city’s colorful historic district, La Candelaria, and regional ecological events like the algae blooms of the Cano Cristales. Topographic undulations in the surface of the landscape create depth for large planting areas above the underground parking structure and provide lush enclaves for people to enjoy in an urban setting. 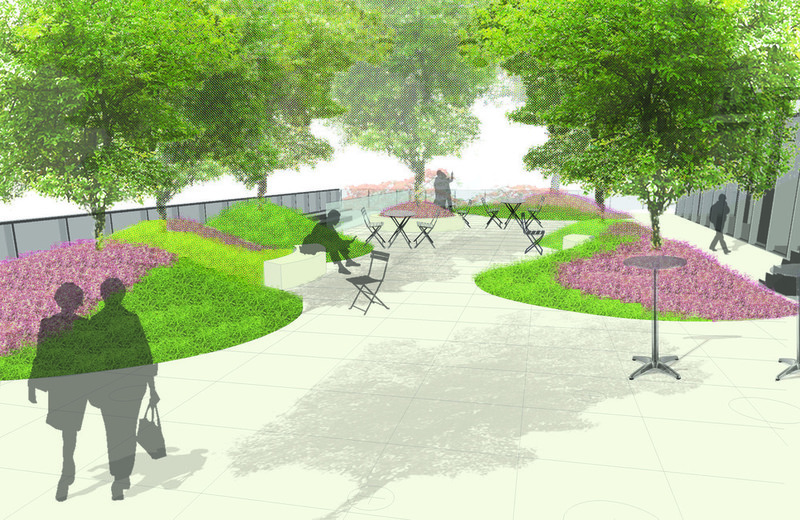 The central idea behind the landscape design for Puerto Triana Development is on the one hand to create a shaded and cool path, with sounds and vapors of water, and variations in the degree of shade and shadows. On the other, two terraces on commercial podiums into the pubic circulation patterns doubling the pedestrian walking space (under construction). The organization of West 53rd Street was generated by an urgent need for programmatic flexibility in limited outdoor terrace spaces. Interior green spaces and terraces were carefully planned and designed to accommodate a multitude of activities from the more private garden use to large scale communal events. This project started with a research into the various types of activities that a residential complex could accommodate in terraces of various light, wind and noise characteristics. By analyzing and fully understanding the nuances and intricacies of how residents might use their outdoor spaces over time, we were able to create spaces that are responsive to the various user types throughout the day in four different seasons. In 2008 a dramatic 500 year flood devastated a large portion of the Iowa University Art Campus. 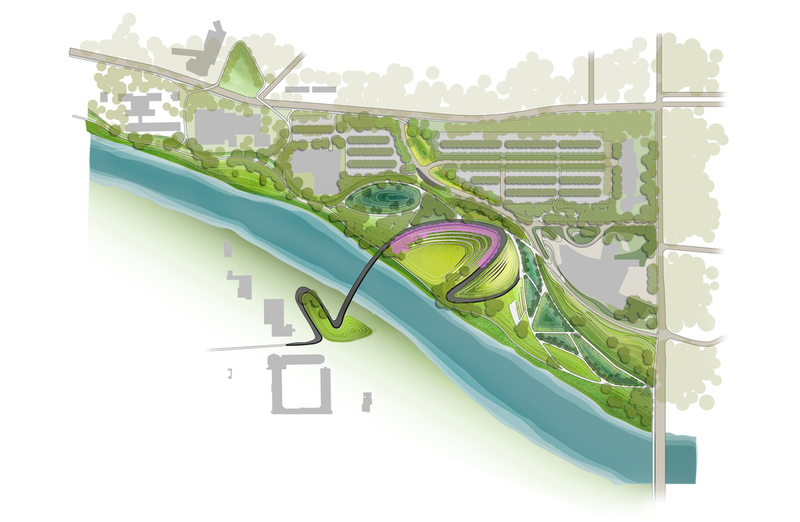 Balmori Associates’ set out to re-imagine the relationship between the Iowa River and its surrounding landscape where the Arts Campus resides. 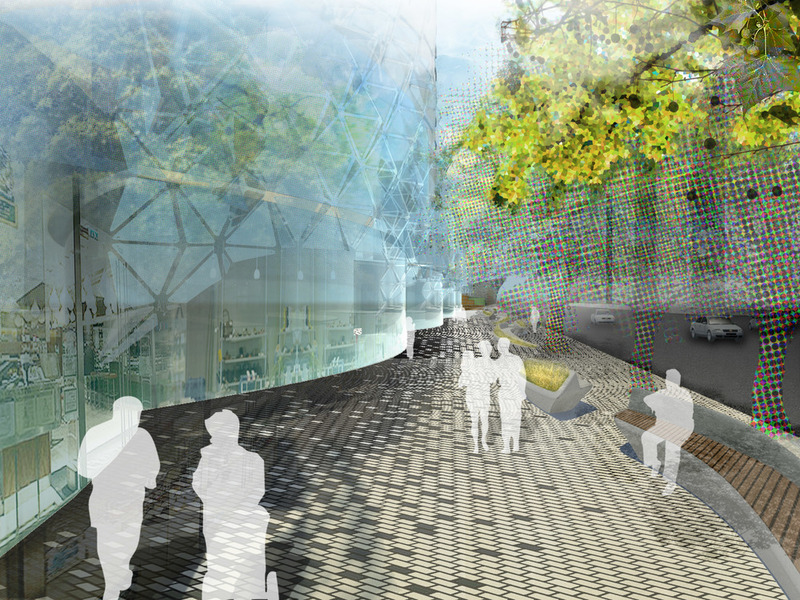 Balmori's Master Plan for the Arts Campus that provides the river and university with new currents of connectivity, creativity, and environmental performance. 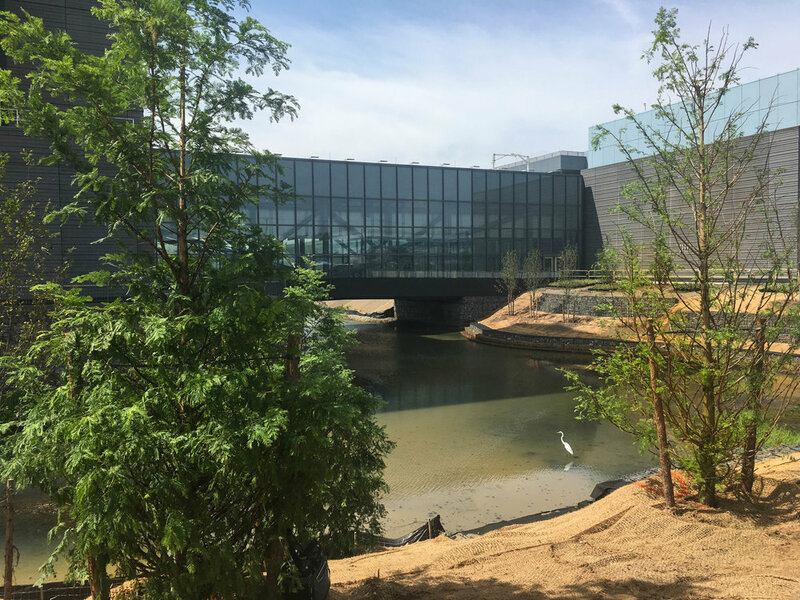 Topographic depressions around the New Hancher Auditorium create spaces that are flexible and configured to embrace the variable character of the river. These depressions are designed to provide public space for large outdoor performances and social events, but also allow for the river to expand during large flood events. Considering the larger effects of the 2008 flood, Balmori’s strategy can be seen as a prototype for water management, that if replicated on a regional level would be capable of attenuating increased flooding threats brought about by the urbanization of the Iowa River Corridor. Additional areas of water treatment and infiltration serve to collect, clean and permeate storm water on site instead of piping it directly into the river. This decreases water flow and velocity of water in the Iowa River implementing a soft approach to flood prevention, a strategy that becomes a powerful flood management tool when repeated. The new LEED CUNY City Tech Academic Building in Brooklyn New York, was created as a landscape that forms a continuous surface from the sidewalk entrance through the lobby to a garden courtyard. 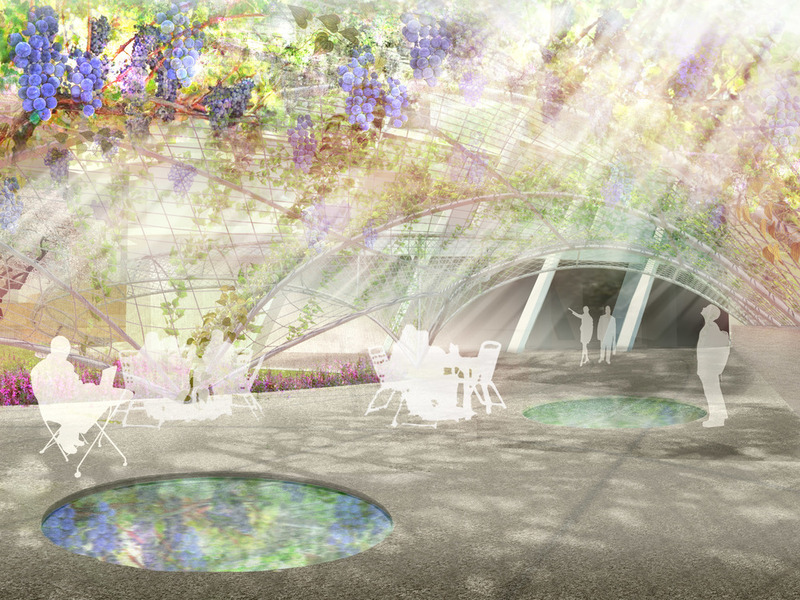 The idea is to enliven the public spaces and create a sense of the garden in the lobby. The design plays with a pixilated pattern of the paving that feathers into the lobby and auditorium and then fades into the courtyard. The pattern extrudes in the entry garden to become shallow reflecting pools made of stone that catch light when turned on and are sculptural objects when turned off. The pattern fades from paved to planting along the curtain wall edge and lobby with both exterior and interior plantings. As the pattern moves through to the courtyard- again the ratio of green to paved transforms into a lush garden with a perimeter of planting. Low water native plantings are used and materials will be chosen for their sustainability, reflectivity and efficiency. 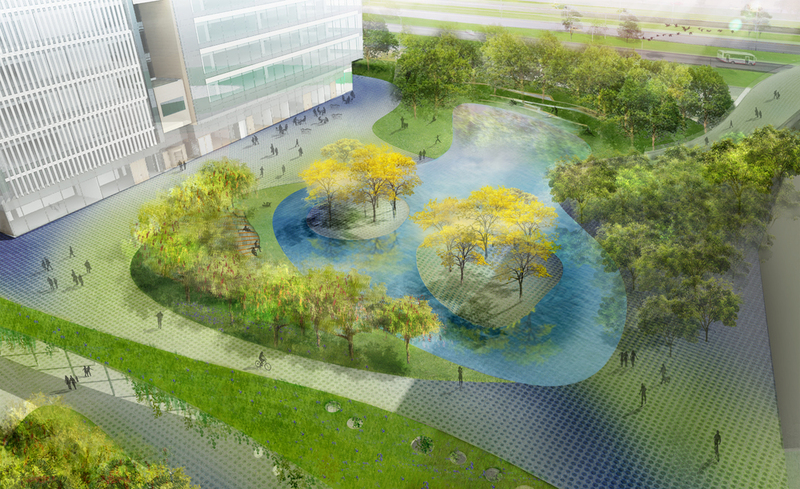 Recycled water for reflecting pools and irrigation could also be used as part of the design. 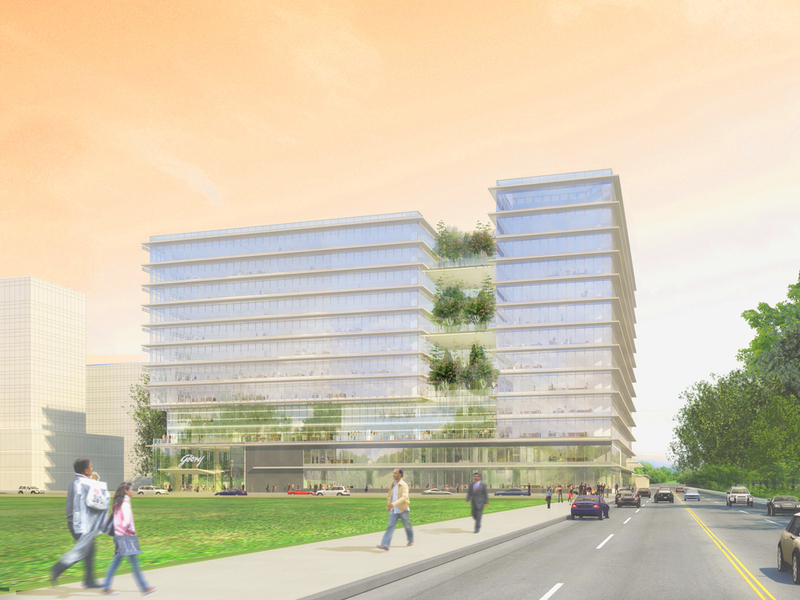 The Hermas Development will feature four office buildings organized around a central courtyard. Each building has retail on the ground floor, nine office floors, and a tenth roof level amenities connecting all four buildings. The roof level amenities house the Al Kamal headquarters, a Spa, Gymnasium and a restaurant for fine dining. Sitting on a site area of 15,220 m2 and rising 47 meters in height Hermas Development will be LEED Certified and have a 5 star QSAS rating. An Islamic pattern is reinterpreted through the site. Modified, scaled, simplified, the pattern becomes at times the layout of the courtyard, at others, a paving pattern, the edge of the water feature, and benches. The shade, the sound of the water, the vegetation and the color palette will provide a sense respite and freshness as soon as one enters the courtyard. Materials with warm colors are selected for the streetscape and cool color ones such as greens and greys for the courtyard. The planting palette for the courtyard showcases native tall vertical palms and acacias well-known for their horizontal canopy. The sun study of the courtyard maps areas of sun exposure suitable for planting trees, and consequently where the earth berms up to allow for planting depth. The terraces on the 4th and 10th floors feature pixel like planters allowing for more intimate spaces where one can sit alone or in a small gathering. The terraces of the 4th floor have a white, a red, a blue and a yellow garden; the ones on the 10th floor have a scent garden, an edible garden and an orange grove. The vegetated roof of the 9th floor displays arabesques of sedums. Located in the heart of the Huangpu River Complex district of Pudong, Shanghai’s booming economic development zone, Tong Shan Jie Master Plan calls for eight residential towers, a hotel, and a clubhouse arranged around a figural open space. 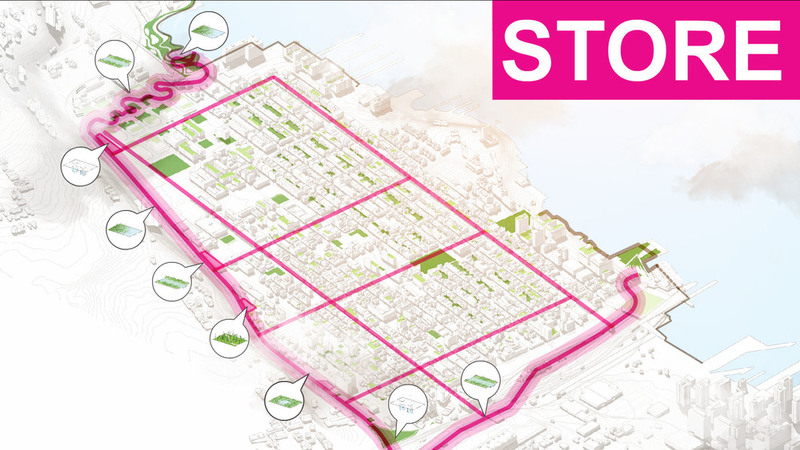 The Master Plan defines a new sustainable landscape, increases environmental awareness, and provides high quality urban living. 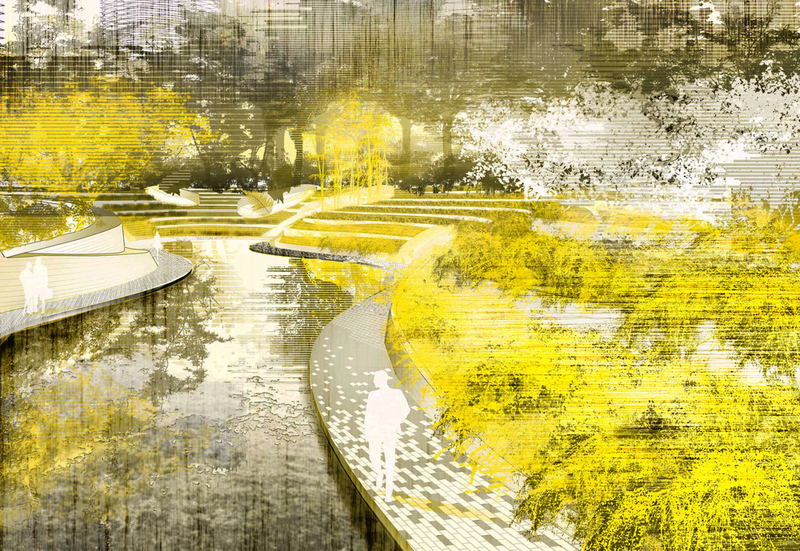 The design intention is to tie the architecture together through landscape and program while enhancing the individual character of each tower by creating unique gardens such as a moss garden, a trellis garden, and a rock garden. The main sunken garden features water cascades, a reflective koi pond and a floating tea pavilion within a lush landscape of cherry and magnolias trees. The necessary underground parking garage ventilations became an opportunity to establish visual and spatial connections through water, light, and vegetation. Balmori Associates collaborated with video artist Marina Zurkow and computer scientist Nikolaus Correll to develop interactive features. The pavilion, whose floor is made up of hundreds of LED “insects”, has the ability to detect touch, including footsteps. Dragonfly shaped LED lights interact with people as they enter the pavilion. The dragonflies might cluster around a single user’s feet, scatter if there is high foot traffic, or hover during low traffic. The dragonflies can also “travel” with a participant over the floor. Fast foot actions might startle them and cause them to move away quickly. They might act as individuals or with a swarm mentality. When the pavilion is unused the insects have sets of behaviors that are affected by the weather, becoming sluggish when the atmosphere is hot and wet and speedy when crisp and dry. Sound Waves embodies the feelings triggered by viewing nature as depicted in Chinese landscape painting, reproducing the appearance of the magical Guilin’s mountains of the Li River. Bands of planting, like three-dimensional brushstrokes, play on the conventional reading of topographic contours, not connecting points of equal elevation, but instead mapping areas of similar conditions. 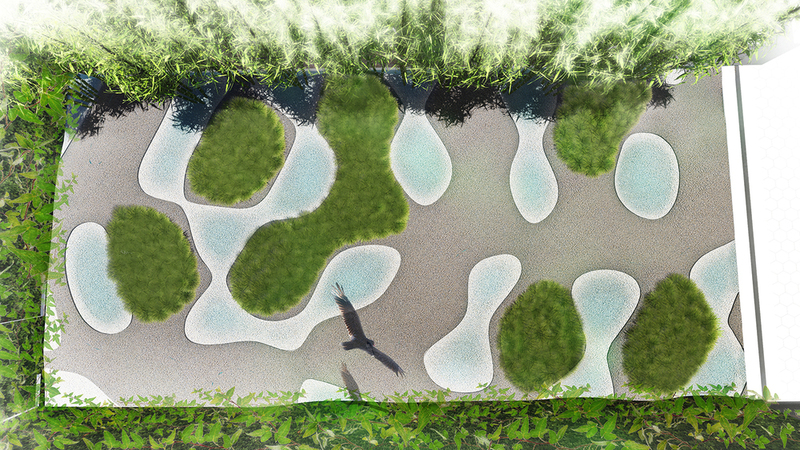 To capture over 140 different site conditions, Balmori constructed a parametric computational model of the garden that adapts to and aligns with transient information flows. Advanced programming methodologies allow the model to analyze year-round natural conditions of a particular area of the site, including sun hours per day, slope conditions, altitude, and wind exposure. The model performs by subdividing the site into a fine grid of points, which are then analyzed individually. The experience is shaped by various paths that ascend and descend through the garden, hovering above and cutting through the site to offer perspectives to the hills and over the valleys. 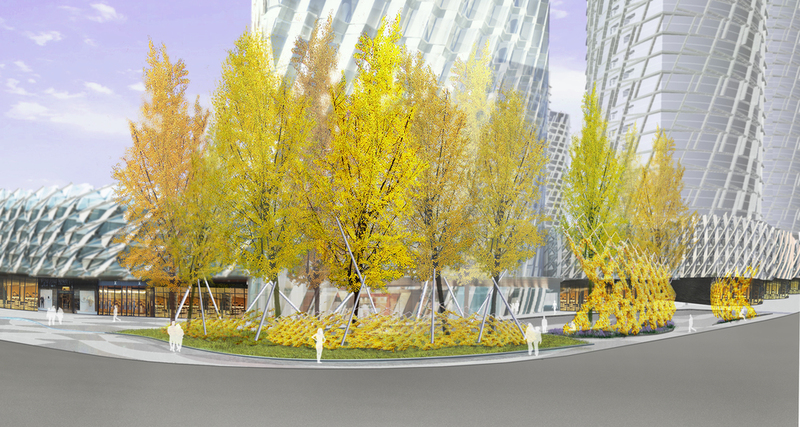 Balmori’s selection of plants builds upon the goals of the Expo with a focus on seasonal colors, textures, smells, and capacity to clean the city’s polluted air. A large park will form the heart of this mixed-use development, with unique and colorful pocket parks integrated into the spaces between the architecture. Rooted in Godrej’s commitment to ecology and sustainability, the overall landscape concept is designed to manage the site’s water; complementing the building programs and activities. Water, both abundant and scarce, is a valuable resource in the Mumbai landscape. Various measures collect storm water during the summer and use it when rainfall is limited. All buildings, infrastructure and landscape will be built with the unique ecological condition of Mumbai in mind. Godrej Headquarters is the first piece of the master plan development. 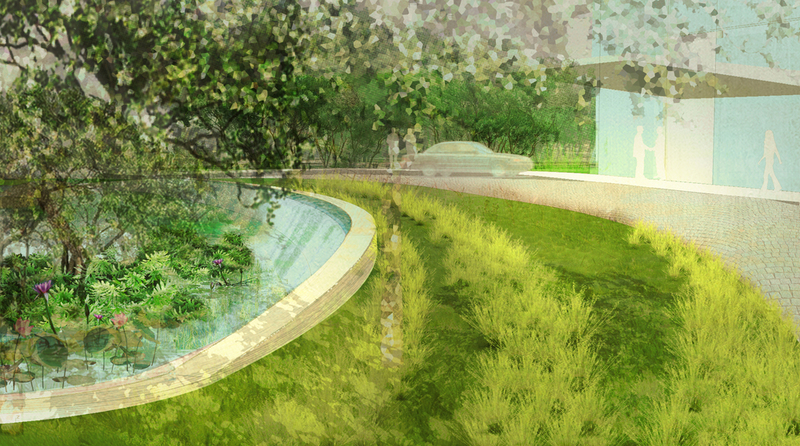 The celebration of water is the central idea for the landscape spaces which weave throughout the building. Integrated water systems move through the project’s tree swales and green roofs that collect, clean and recycle the water. This water is then used for irrigating the plantings and replenishing the Water Gardens. The landscape enters the project through interior lobbies and atriums. Native water gardens frame the headquarters. Bamboo fills the atrium with veil like planting to the skylights. Terrace gardens define the façade and create lushly planted spaces within the building. All plantings are native and adaptive species that require less water. The planting design was qualified as part of the LEED Platinum certification of this project.